At least 150 participants from the global research and education collaboration community converged at VIP Grand Hotel in the coastal city of Maputo, Mozambique on 19-20 November 2015, to attend UbuntuNet-Connect 2015; the eighth annual networking conference of UbuntuNet Alliance for Research and Education Networking. 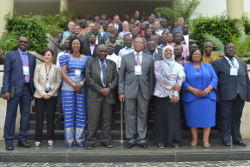 The conference, held under the theme: “Beyond Connectivity: The Road to NREN Maturity” was organised and jointly hosted by the Mozambique Research and Education Network (MoRENet), through the Ministry of Science and Technology, Higher Education and Vocational Training. At 9:30hrs local time on November 19th 2015, line Minister of the host ministry, Prof. Doutor Eng Jorge Olivio Penicela Nhambiu declared the conference open; The next day, at 16:30hrs UbuntuNet Alliance CEO Dr. Pascal Hoba was delivering a “Thank You” message to the participants for making UbuntuNet-Connect 2015 a success. The conference had come to an end. Between the minister’s opening and Dr. Hoba’s closing remarks, a total of 34 presentations were delivered; 28 from presenters whose abstracts were selected from the 61 that were submitted for selection, and 6 from special projects from networking partners. On the first day, the presentations covered three sessions on ‘NREN as a tool for national development,’ ‘E-learning and web applications for collaboration’ and ‘Video conference as a service. The second and last day of the conference, November 20th had 4 sessions on ‘International Collaboration in Research,’ ‘Regional RENs and Security,’ ‘Applications in Service delivery’ and a special research project and output session that had presentations from the Uganda Medical Informatics Center (UMIC), Sci-GaIA and MAGIC projects and the African Academy of Sciences (AAS). As the curtains were being drawn and banners pulled off the walls of the conference room, there was an evident impression of satisfaction on the smiling faces of the delegates some of whom had arrived in Maputo as early as November 14 to attend designated pre-conference events. The pre-conference events included a 4-day network engineer training workshop that started on November 15th, the AfricaConnect2 Administration, Coordination and Communications Plan and Visibility meetings, the MoRENet, MAGIC and Sci-GaIA workshops and not forgetting the SomaliREN and World Bank workshop meeting which launched the NREN’s mission to connect to the UbuntuNet network under the AfricaConnect2 project. As UbuntuNet Alliance takes stock of UbuntuNet-Connect 2015, eyes and minds of people of the Alliance are now set on UbuntuNet-Connect 2016.